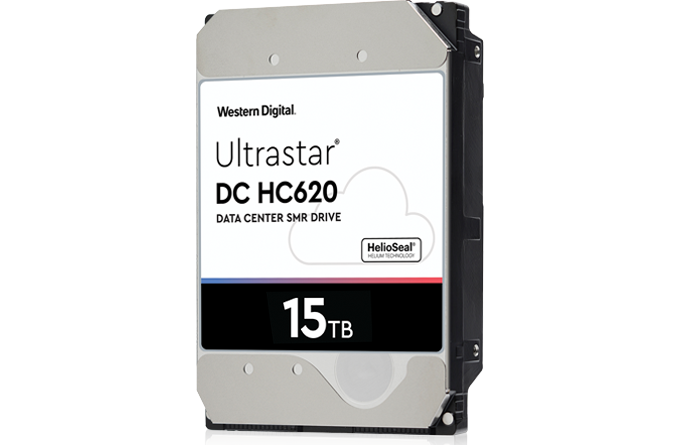 Western Digital this week introduced its new Ultrastar DC HC620 family of hard drives that consists of 14 TB and 15 TB models. The HDDs use shingled magnetic recording (SMR) technology and are aimed at applications that need a lot of storage space, but are mainly read-focused operations. The manufacturer will only sell these products to customers with software that can manage SMR hard drives, primarily to those who already run 10 TB or 12 TB SMR HDDs. The HGST Ultrastar DC HC620 hard drives are based on Western Digital’s fourth-generation HelioSeal helium-filled enterprise platform that packs eight platters and employing multiple enhancements of internal components specially designed to improve reliability and durability of HDDs working in vibrating multi-drive environments. The DC HC620 HDDs use eight SMR platters with a 1.75 TB and a 1.875 TB capacity featuring a 1034 and a 1108 Gbit areal density per square inch respectively. Because of a very high areal density, the 14 TB version of the drive offers up to 233 MB/s sequential read/write speed, whereas the 15 TB variant can hit 255 MB/s sequential read/write speed, which is the world record for any SMR HDD. Keep in mind though how SMR technology works – it records new magnetic tracks partly overlapping the previously recorded tracks in a 'shingle roof tile' fashion. This method is appropriate for sequential writes, but as multiple tracks need to be adjusted when re-writes occur, it slows down the rewriting process. As a result, SMR-based HDDs are good enough for archive as well as write once read many (WORM) applications (think content delivery services), but is not suitable for typical server or enterprise workloads. Another thing to point out about high-capacity HDDs in general and Western Digital’s Ultrastar DC HC620 15 TB in particular is the fact that as capacities increase, IOPS per TB performance drops and it gets increasingly harder for operators of datacenters to guarantee their customers expected performance and quality of service. Therefore, while technically the Western Digital’s 15 TB is the world’s highest-capacity hard drive that exists today, it is necessary to understand that this is a very special product aimed at select customers with systems that take into account peculiarities of SMR and can mitigate lower IOPS per TB performance to minimize impact on QoS. The Ultrastar DC HC620 HDDs feature a 7200 RPM spindle speed, a 512 MB DRAM buffer for indirection table management, a 7.7 ms read seek time, a 12 ms typical seek time, and a 4.16 ms typical latency. The manufacturer will offer the new series of HDDs with a SATA 6 Gbps or with SAS 12 Gbps interface. As for power, the DC HC620 SATA drives consume up to 6.4 W, whereas the DC HC620 SAS HDDs consume up to 8.3 W, which is in line with power consumption of their direct predecessor, the Ultrastar Hs14 (which in case of the 14 TB version of the DC HC620 is the same drive), but significantly lower than prior-generation of SMR HDDs from HGST. Like other enterprise-class HDDs, the Ultrastar HC DC620 HDDs are rated for 2.5 million hours MTBF and come with a five-year warranty. Given the fact that the hard drives will only be sold to select customers, Western Digital does not publish per-unit pricing.